Originally made and given to Mothers on Mothering Sunday. It was not eaten on Mothering Sunday because of the rules of Lent, instead it was saved until Easter. The word simnel probably derived from the latin word ‘simila’, meaning fine, wheaten flour from which the cakes were made. 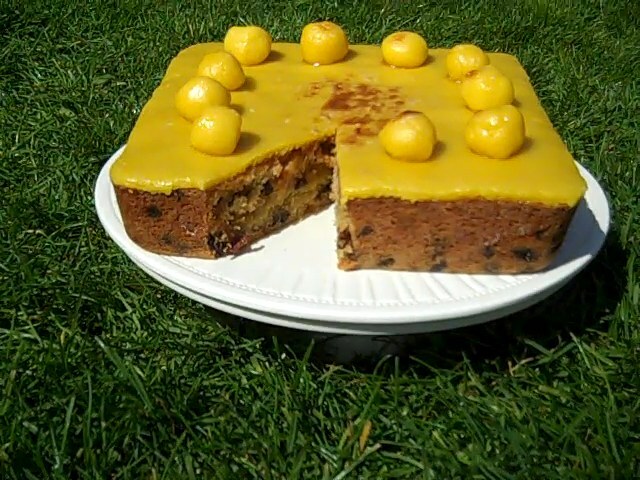 The Simnel cake is a fruit cake. A flat layer of marzipan is placed on top and decorated with 11 marzipan balls representing the 12 apostles minus Judas, who betrayed Christ. 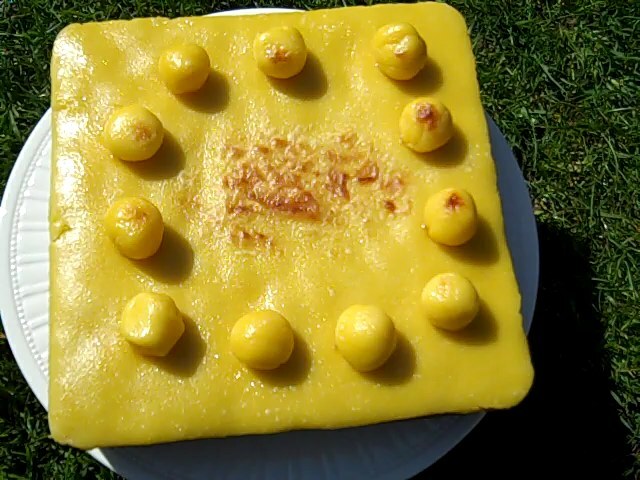 Simnel cake is still made in many parts of Britain today, although it is now more commonly made for and eaten at Easter. Roll out a third of the almond paste to make a circle 18cm/7in in diameter and reserve the remainder for the cake topping. Preheat oven to 140C/275F/Gas 1. Grease and line a 18cm/7in cake tin. Cream the butter and sugar together until pale and fluffy. Gradually beat in the eggs until well incorporated and then sift in the flour, salt and mixed spice a little at a time. Finally, add the mixed dried fruit, peel and grated lemon zest and stir into the mixture. Put half the mixture into a greased and lined 18cm/7in cake tin. Smooth the top and cover with the circle of almond paste. Add the rest of the cake mixture and smooth the top leaving a slight dip in the centre to allow for the cake to rise. Bake in the preheated oven for 1¾ hours. Test by inserting a skewer in the middle – if it comes out clean, it is ready. Once baked, remove from the oven and set aside to cool on a wire rack. Brush the top of the cooled cake with the apricot jam. Divide the remainder of the almond paste in half; roll out a circle to cover the top of the cake with one half and form 11 small balls with the other half. Place the circle of paste on the jam glaze and set the balls round the edge. Brush the cake topping with a little beaten egg. Preheat the grill to high. Place the cake onto a baking tray and grill for 1-2 minutes, or until the top of the marzipan begins to brown. Alternatively, lightly heat the cake topping using a cook’s blow torch, until the marzipan is golden-brown.